Mo said she was quirky is a new novel by Booker prizewinner James Kelman. Her boyfriend said she was quirky but it was more than that. Some things were important in life. You had to fight for them. Helen was prepared for that - only she wasn't as strong as people thought. Working nightshift as a dealer in a London casino didn't help. Her young daughter at home in bed - just how safe was she? The gamblers staring you down, night after night after night. Then on the way home from work this tall, skinny, down-at-heel guy crossed the road in front of her taxi. Brian? Her long-lost brother? How could it be? 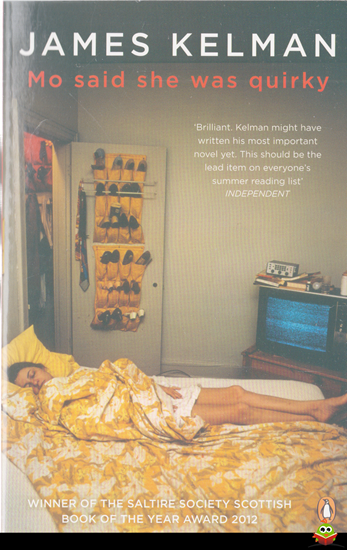 Twenty-four hours in the life of Helen, an ordinary young woman - as ordinary, as unique, as each and every one of us. Praise for Mo said she was quirky: 'A charming and often tender book. A small gem of a novel from one of our greatest living writers' TimeOut 'What is remarkable about Mo said she was quirky is its gentleness, its compassion, its desire to understand, its art' Herald 'A brilliant novel . . . The sort of threadbare life lived by Helen is so rarely given any unsentimental coverage in fiction that . . . Kelman may have written his most important novel yet. This should be the lead item on everyone's summer reading list' Independent 'Absorbing, affecting . . . Helen is a character drawn with a rare empathy and patience . . . Kelman's dialogue is minimal but acute' Financial Times 'Sad, tender . . . Kelman is not a growling and sanctimonious stereotype, but a bitter-sweet laureate of decency' Stuart Kelly, The Times 'An urgent, compassionate, mesmerising reflection of our present moment' Independent on Sunday James Kelman was born in Glasgow, Scotland. His story collections include Greyhound for Breakfast, The Burn, The Good Times and most recently If it is your life. His novel How late it was, how late won the 1994 Booker Prize. Other novels include Translated Accounts, You Have to be Careful in the Land of the Free and Kieron Smith, boy. In 2009 and 2011 James Kelman was shortlisted for the MAN Booker International Prize. Mo said she was quirky was the Saltire Society Book of the Year for 2012.